"When I was a little boy, we children traded paper hearts at school on Valentine’s Day. At night we dropped them at the doors of our friends, stamping on the porch and then running in the dark to hide. "Almost without exception those valentines had printed on their face, 'I love you.' I have since come to know that love is more than a paper heart. Love is of the very essence of life. It is the pot of gold at the end of the rainbow. 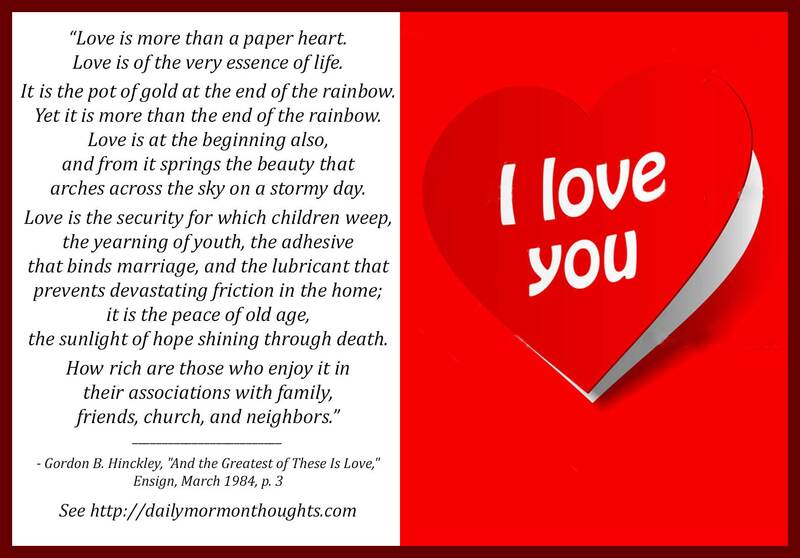 Yet it is more than the end of the rainbow. Love is at the beginning also, and from it springs the beauty that arches across the sky on a stormy day. 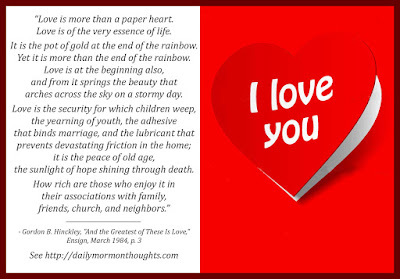 Love is the security for which children weep, the yearning of youth, the adhesive that binds marriage, and the lubricant that prevents devastating friction in the home; it is the peace of old age, the sunlight of hope shining through death. How rich are those who enjoy it in their associations with family, friends, church, and neighbors. "If the world is to be improved, the process of love must make a change in the hearts of men. It can do so when we look beyond self to give our love to God and others, and do so with all our heart, with all our soul, and with all our mind." 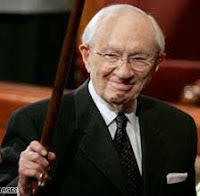 President Hinckley's conclusion speaks of the importance of love as the key to bring about change and improvement in the world. It starts with individual hearts, as each heart is changed and learns to love others as Christ loved us. Once we reflect His perfect love in our interactions with those around us, our individual world truly will be changed, and the broader world we are a part of will begin to feel the impact as well.